$754.67+ My 2nd AMD Ryzen Build! Great for the price. No problems booting up for the first time. BIOS is kind of slow and overclocking is kind of buggy (overrides voltage alot). 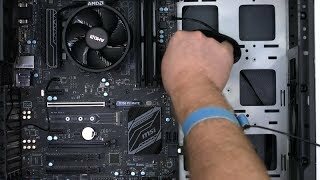 Fan controller in the BIOS is easy to use. Red light always on because Ryzen 7 has no iGPU.. Seems like I have to up the voltage a little higher to achieve stellar overclocking. Anything above 3.7ghz on auto voltage crashed my computer. Used 1.4000/1.375 volts and got the Ryzen 5 1600 to 3.9 ghz. Didn't try to go higher. Settled into a 3.75ghz at 1.3357 volts which gave me a Geekbench multicore rating around 20,000. When I had it at 3.9ghz my Geekbench multicore rating was 21,000+. What more could a person ask for from a motherboard. Simple to OC and inexpensive. Would buy again if I only wanted to spend $70. If I could give it a 4.5 rating I would. from completed build Computer Build by an 8 yr old kid! MSI has the best GUI-based BIOS I have ever seen. Its strong, plus at this price, surprised that it lasts a while. Great price for the amount of features it has, my only problem with it is that my RAM won't run at it's full 3000MHz, although this is something that could be fixed with a BIOS update. EDIT: A Beta BIOS from MSI fixed this, expect the full release soon. 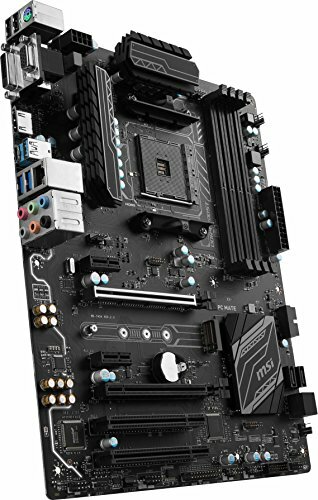 Some features: - 4 fan connectors and 1 pump fan connector - AMD crossfire support - 4 ram slots with max at 3200mhz - M.2 slot It's a very nice mobo with a neutral colour theme packed with features that I don't even need. However there is one thing I'd like to nitpick. Although I could easily go to the bios on the starting screen before installing the os, afterwards after I press the delete key trying to go to the bios I was for a short time met with a black screen then the Windows startup. Tried using another keyboard but it still didn't work. The only way was to go to settings and manually go to it from there. 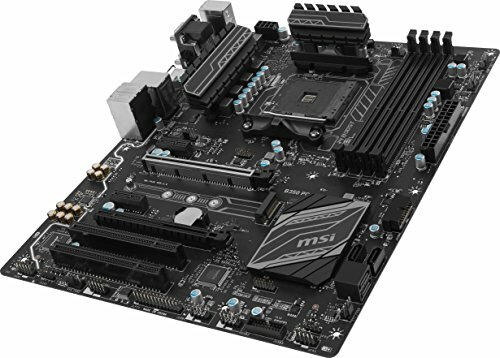 This is a great budget B350 AM4 Motherboard from MSI. It has all the features I want with none of the fluff. The difference between this and the Gaming B350's MSI offers is that the capacitors may be of slightly lower quality. From what I have read this means the motherboard will burn out in 10 years instead of 15+ or so. Not a big issue for me as I plan to upgrade the computer piece by piece over the years. I did have to send this into MSI to get the BIOS updated but Newegg determined that the CPU was dead on arrival and defective so that may have been the issue instead of the board. The BIOS is easy to use and with the fully updated firmware I can now support higher speed RAM's. Worked on first boot with my Ryzen 5 1600 and had no issues in updating the BIOS right away. Have only been able to overclock my RAM to 2933MHz and not 3200MHz yet. Hopefully with future BIOS updates, this will be made possible. Had some issues with overclocking my CPU too. Whenever I changed the voltage to something other than auto, the overclock fails and often fails to even post. 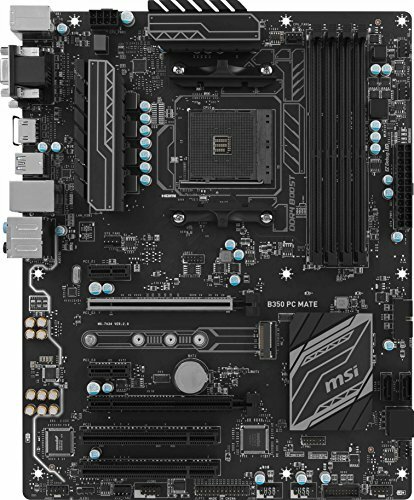 This mobo was very simple to use and easy to install. It also looks very nice and clean. I figured for a first time build, I didn't need anything more than this. It booted up with no problems and the BIOS is easy to use, although a tad slow. Very pleased overall. Glad I went with this one. 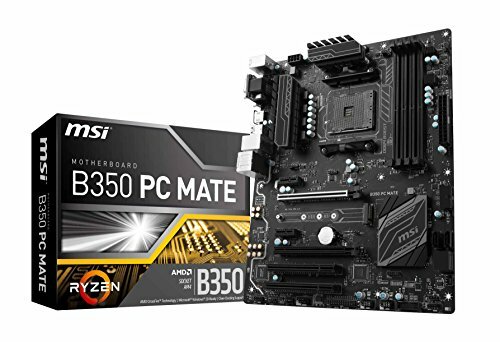 Good motherboard for the price, supports high speed memory with latest BIOS update and overclocks great.